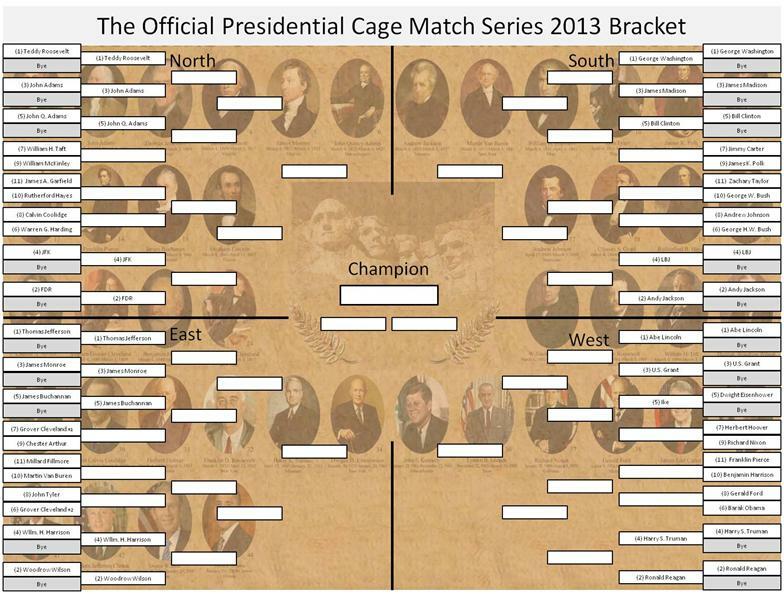 We are hosting Round 1 of the 2013 Presidential Cage Match as a GoogleHangout. This is largely for GMU History Alum and other select invited personnel… I will, however, post results on the Blog. Bracket is public today! Download here: 2013 Bracket (.ppt) and 2013 Bracket (.pdf). Round 1 will be a speed round. All Presidents battling will get a 15 min round. Judging will be computed from points made and detracted from people in the room, on the HangOut and on Facebook. I will compute the points and trust me… the quality will deteriorate through the night. My best guess… if we start at 7pm, round 1 is complete by 10 pm. (+/-) The judge (me) reserves the right to extend lively debate or call a match early for lack of participation. Scorekeeping will be high-tech… via whiteboard at my house… and recorded accordingly.